The Canadian election is almost one month away. 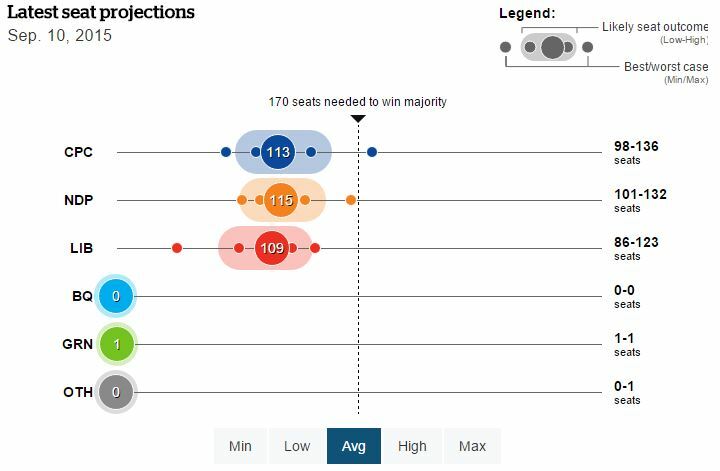 If it were held today, the three main parties – the right-wing Conservatives, the centrist Liberals and the centre-left New Democratic party (NDP) – have almost even odds of winning. Compared to the last general election in 2011, this is remarkable for three reasons. First, the Conservatives are polling a full 10 points below their 2011 results (39.6 per cent). The election campaign has been dominated by a strong ‘anybody but Harper’ feeling. Over the past nine years of Conservative government Prime Minister Stephen Harper has moved the country sharply to the right. He has been accused more than once of passing undemocratic legislation – bills that suppress voter turnout, infringe on civil liberties, and remove the independent elections monitor among others. Under Harper, Canada’s peaceful reputation has been starting to crack – the UN human rights committee has criticised the government on seven different counts, including its failure to act on reports of murdered and missing Aboriginal women and its new anti-terror law, which lacks proper governance. Furthermore, a series of senate scandals involving the Conservatives have kept the public disillusioned with the state of democracy. High-profile Conservative writers and journalists have been openly criticising Harper’s involvement in them. About 70 per cent of Canadians were closingfollowing the trial of senator Mike Duffy (EKOS poll, 1 September 2015), the most high profile scandal. With the trial currently on hold until November, this partly explains why the Conservatives have recently gone up in the polls (compared to the 25 per cent they were polling a few months ago), as the attention has turned to the economy. With Canada currently in recession due to falling oil prices, the Conservatives are tied with the Liberals as being best placed to address economic issues (down from their previous lead), but the NDP is only a couple of points behind. On addressing social issues like health care and education, and helping to restore middle-class progress, the NDP is the clear leader. Overall, 65 per cent of Canadians say the Conservative government is moving in the wrong direction – up 10 points since January this year. Second, the Liberals are up by more than 10 points compared to their poor result in 2011. They had an initial jump in 2013 when Justin Trudeau – son of former prime minister Pierre Elliott Trudeau – was elected leader of the party. The Liberals were in the clear lead for months. This was followed by a drastic fall in support when anti-terror bill C-51 was passed earlier this year. Eighty-five per cent of the public was against it; constitutional experts from around the world wrote letters deeming it as an infringement on civil liberties. While the bill would have passed anyway due to the Conservatives’ majority government, the Liberals voted in its favour. They did not want to appear ‘weak’ on terrorism, even though they did not agree with it entirely. While Trudeau promised to amend the bill if elected to power, many people did not (and still do not) understand how this is meant to be leadership. To many, this was a betrayal of liberal principles. However, after the party revealed its platform in June, cropping a number of ideas from the NDP’s policy book (particularly on electoral and democratic reform), it has won back some disaffected supporters. Finally, the NDP is polling only two points above its score in the 2011 election. It is worth noting though that shortly after the election the NDP fell to around 15-20 per cent in the polls, where it remained until June 2015 – the time of anti-terror bill C-51 and the NDP’s historic win in Alberta (Canada’s most Conservative province). The NDP’s policy platform, focused on democratic renewal as well as more concrete economic and social policies, has a strong appeal to the middle class in particular. Some of its core policies include making childcare affordable, returning the retirement age to 65, strengthening public pensions, and improving healthcare. Thomas Mulcair, the NDP leader, has also pledged to achieve his promises while balancing the budget. While this has resulted in some criticism from the party’s core supporters, who believe that talk of balanced budgets is “the talk of neoliberalism”, it has widened the party’s appeal to centrist voters driven by a desire to oust Harper. About 15 per cent of voters would vote for either the Liberals or the NDP, depending on who was better placed to beat the Conservatives in their riding (constituency) given Canada’s first-past-the-post system. Mulcair is also perceived as a credible leader. He had previously served as a Liberal environment minister in Quebec, and his approval rating sits at 60 per cent (compared to Harper’s 34 per cent). Together, the anti-Harper mood, the perceived economic credibility of the Liberals and the NDP, and the heightened awareness about the deteriorating state of Canadian democracy make it likely that Canadians will have a new government soon. Even if the Conservatives win the most seats, the Liberals and the NDP will face public pressure to work together – 70 per cent of the country is in favour of change.